Right from the announcement of the show, I booked a flight to London right away. I was determined to be there even if I did not have tickets to the show. I figured I should at least be there on sacred ground and feel the reverberations coming from the building. As it turned out I got far more lucky and got two tickets to the show. I entered the lottery at the website just like everyone else. And just like most everyone else I did not get a pass code. I was sad that I did not get a code but certainly was not surprised. The odds of winning one of the codes was truly like winning in a lottery. My next step was to check e-bay. There was some very suspicious sellers with no feedback score, so I stayed away from them. I did however come across a seller in Australia with a high perfect feedback score and a long standing member of e-bay. Confident this seller really had the pass code, I purchased it. I was also lucky in the fact that there was no bidding involved. It was a ‘buy it now’ auction for only $250 us. I bought it, payed the seller via Paypal, and got the pass code. 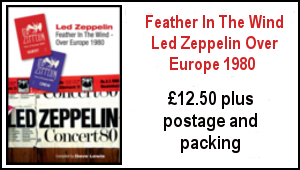 I was now on the Ticketmaster UK website, entered the code, which indeed worked, and purchased two floor standing tickets to the Led Zeppelin reunion show. I was extremely excited in purchasing two tickets to the show of the century when it seemed almost impossible. 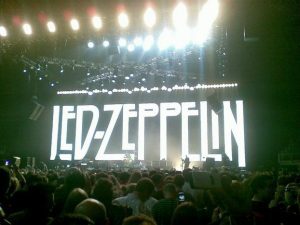 What I wanted most out of life was to see Led Zeppelin. I was 12 years old when they disbanded, so like a lot of people out there, we never got that chance. For myself it was 25 years of dreaming the impossible dream. 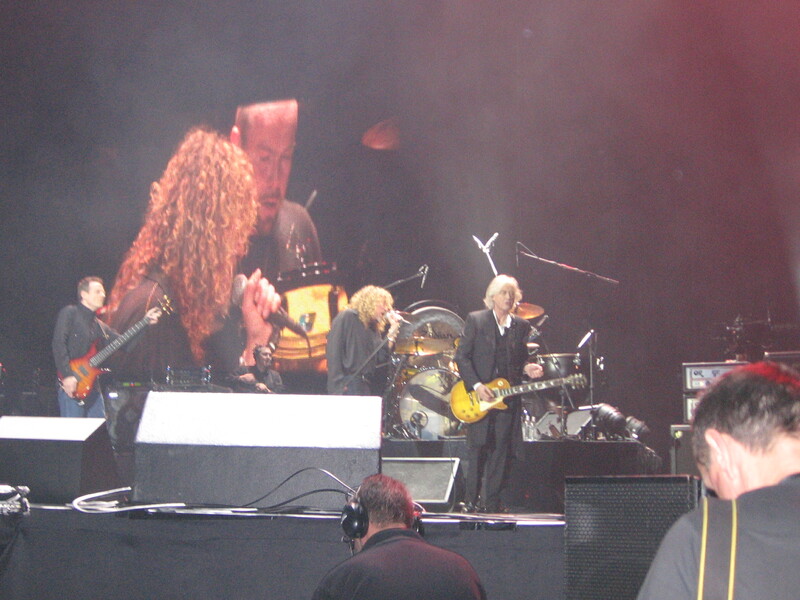 I could not believe that I actually might be seeing Led Zeppelin perform live for an entire show. The whole situation about the promoter and non original pass code holders was a little stressful but I felt their threat of non entry to the show was not enforceable. So fast forward to Sunday December the 9th, my cousin (Fred) and I land in London at roughly 6 am. We hop on the Tube and head straight for the 02 Dome. We arrived at the 02 Dome and waited about one and a half hour to get our tickets that Sunday morning. Praise our lucky stars, our two tickets were there for us with my name on them. We had the Ahmet Ertegun concert tickets in our hand and now we were looking to line up for our floor standing spot. 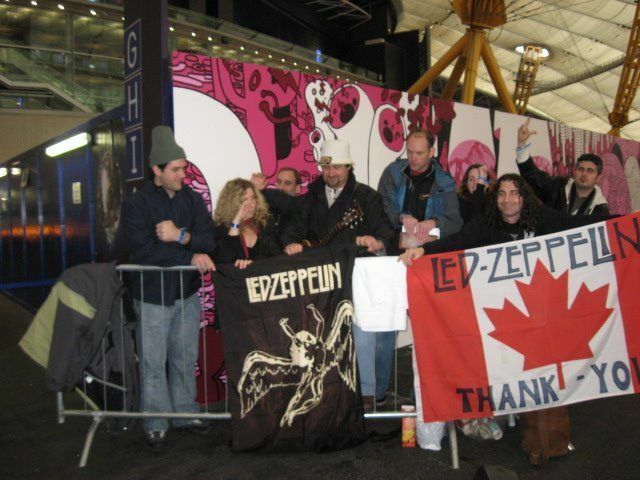 I could not settle for a spot other than right in the front of the Zep Men. We asked a staff member of the 02 as to where we could start a line up. They said the show was tomorrow night. We replied that we know that but we want to start a line up right now. This person thought we were crazy but said go ahead start a line over by gate F. Fred and I had wasted some time in finding gate F and two Americans just beat us by about 15 feet to this gate and a formation of a general admission line up. Nonetheless Fred and I were number 3 and 4 in this line up to this historic event. 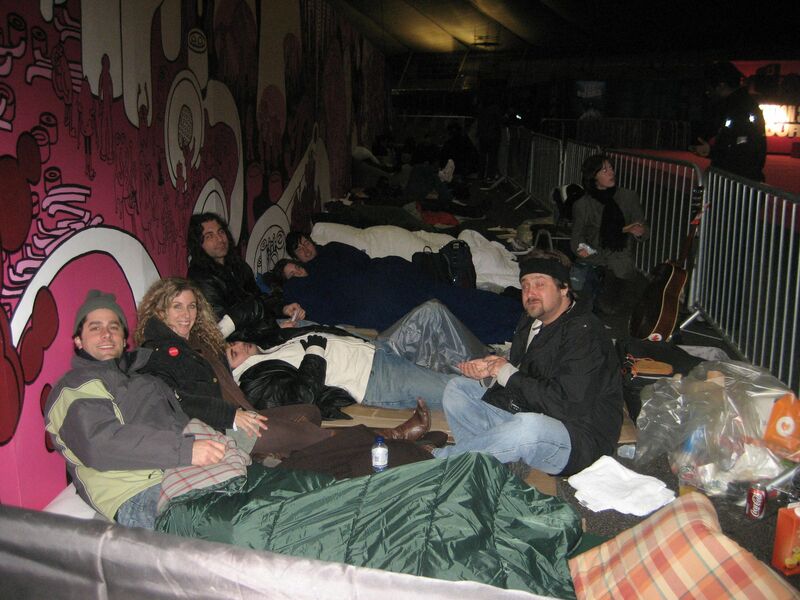 We spent just about 30 hours in this line and slept on a concrete floor (I could not really sleep) so we could be right up by the stage. If I had to, I would have camped out for a month to be that close to the stage. 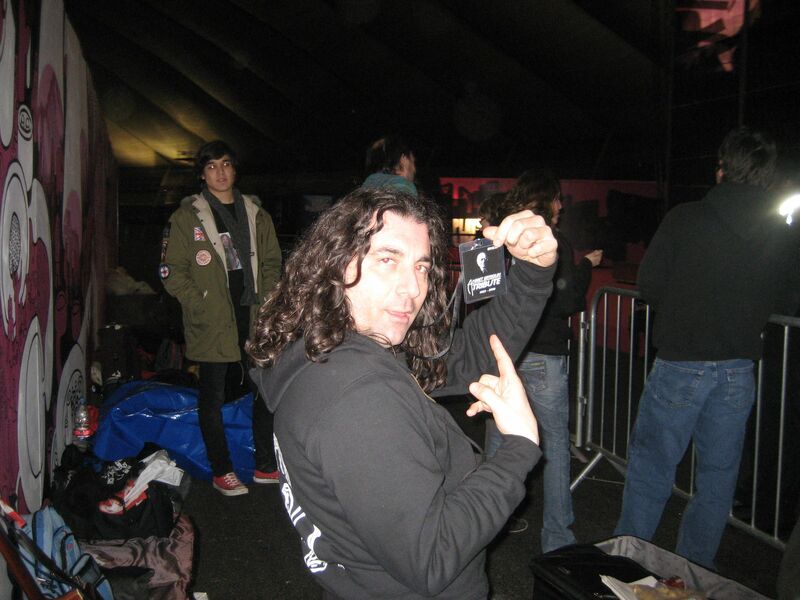 Dave, I want to add how shocked I was that there was about 15 of us camped out over night to get so close. In Canada or America, I bet there would have been 500 of us. The staff at the 02 were great for letting us stay inside the dome. It was still very cold but at least we were not outside. Oh boy, I don’t how I almost forgot to mention that I was lucky enough to get into the rehearsal that Sunday night. 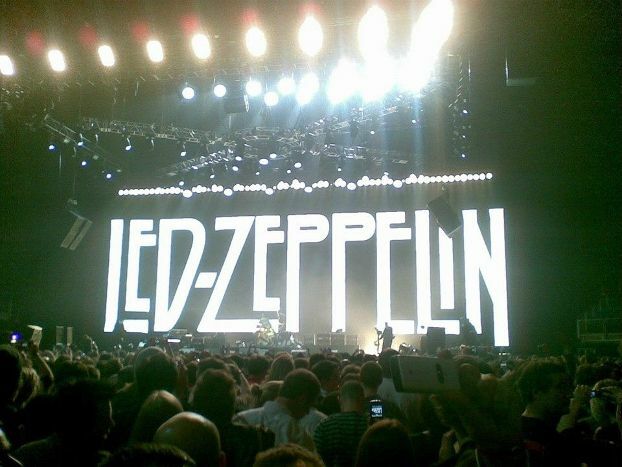 Led Zeppelin are doing a last little rehearsal and sound check on the Sunday night. 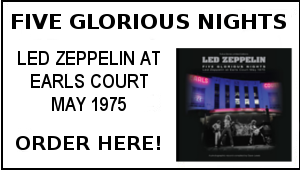 I noticed dozens of people ( maybe you were one of them ) walk by with a sheet of paper in their hand and are allowed entry into the arena while you hear Zeppelin playing. I figured it was some kind of contest thing and these were lucky winners allowed in to see Zeppelin rehearse. I walked closer to the entrance to get a better listen of Zeppelin playing and a staff member asks for my pass. I tell her I do not have a pass and in her sweet British accent she says ‘right you go on in’ and gives me a laminated pass for the rehearsal. This sweet lady is the nicest British person I will ever end up meeting in my life. Such a small thing she did, but the world to me. I entered the arena to the sounds of ‘No Quarter’ and just about jumped ten feet high. It was about a half hour of rehearsal that we were able to take in. 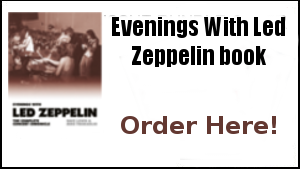 I was already in Zeppelin heaven and the show was still 24 hours away. Monday arrives and this is it. I had not really slept the last two nights because of an over night flight, the time change and a brutally cold dome that Sunday night. None of that mattered on Monday. I new adrenaline was kicking in. All of Monday was so exciting. Hundreds are now starting to flock in. Meeting of new people from around the world. All great people of course. Being interviewed by reporters. Getting your picture taken with others and the Canadian flag. It truly was a wonderful experience. This is what life should be about. And, the show was still yet to happen. It is time for the show. We are all here. The greatest two hours of my life was seeing that Led Zeppelin performance. I do not need to go into detail. We all know how awesome it was. 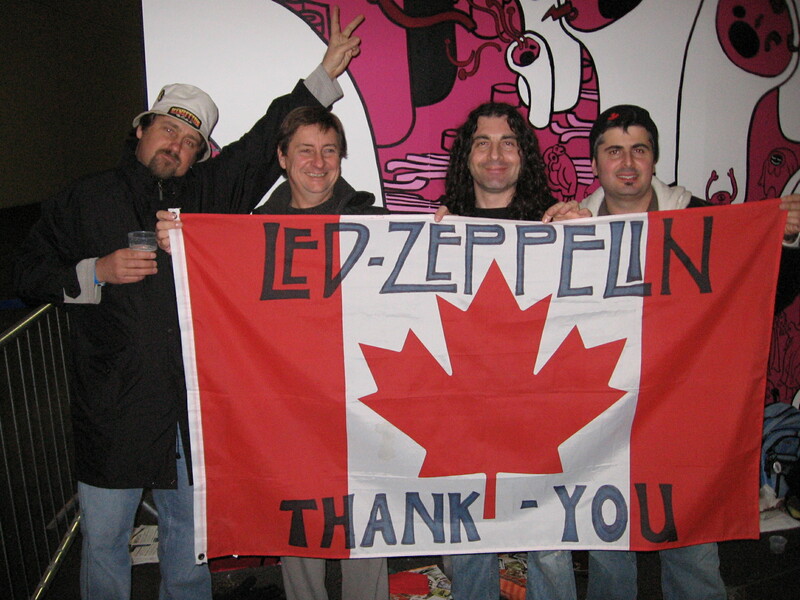 Whenever I am asked about the Led Zeppelin reunion show, I simply say it was amazing. I do not sugar coat it because it does not need sugar coating, it truly was out of this world. Just check out Kashmir on You Tube, Wow. The icing on the cake for myself was being up on the big video screen with my cousin Fred. 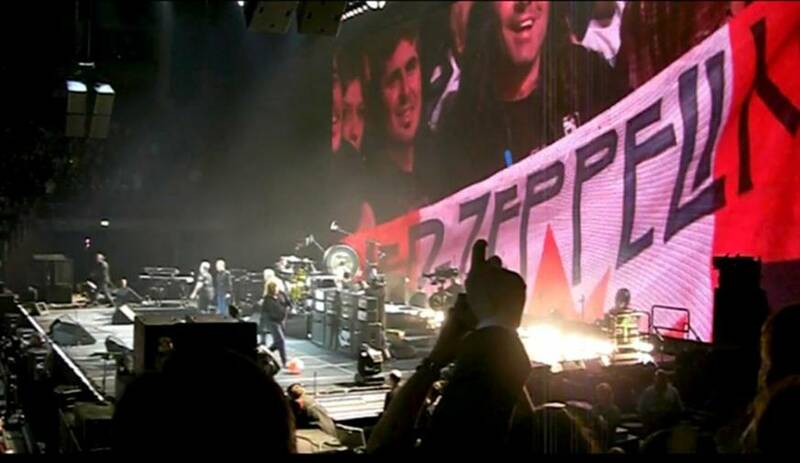 This was at the end of ‘Rock and Roll’ where we were all smiles on the video screen, then it fades to black and then you see the huge letters – LED ZEPPELIN. Thank you for sharing your experience. I bet it was nothing short of amazing.